Several months ago Pizza Hut, at least in the Minneapolis market, made a subtle change to its delivery and takeout pizza boxes. 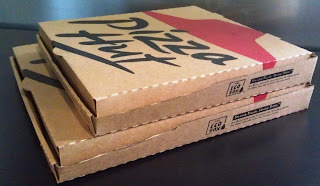 On the large pizza corrugated box, they reduced the front rolled edge of their box by about half of the total box height. It seems to have little to no effect on performance of the box and its delivery of your pizza, and unless you are a packaging nerd like me (yes, pizza boxes are a form of packaging), you probably would have never noticed. On their medium pizza, they did a similar design change; also the medium is a thinner board (F instead of B Flute) than the large, not sure if it has always been that way. However, this small and subtle change is the kind of thing many companies could and should be doing to make reductions in theirsustainability footprint and to save money. By reducing the front rolled edge of their pizza box, they reduced the flat footprint of their box by 4.1%. Now 4% does not seem like a huge number, but at Pizza Hut USA volumes (estimated 675,000 boxes per day), that is an annual reduction of over 46 million square feet of corrugated board. To put that in perspective, that would be an NFL Football Field w/o end zones over 128 feet high. Now that is a serious pile of corrugated eliminated from our waste stream every single year. Solid Model of how much corruaged was save, notice how small the goal posts look! On a per pizza box basis, the cost savings is approximated at just over a ½ cent per pizza, so don’t look for a big discount on your favorite stuffed crust pizza, but at their annual volumes the cost savings could easily be around 1-2 million dollars. While we didn’t have anything do to with this change, this is a shining of example of the kind of cost reduction opportunities that are available to many companies and the type of thing that Chainalytics Packaging Optimization Practice helps their clients implement on a regular basis. Pizza Hut's is an excellent example of how small, incremental changes can make signficant impact. Not only that the subtle change to the Pizza Hut pizza box saved resources, it also is driving additional profits to their bottom line. With many of these changes, you need to zoom out from just the package change. Did the sheet size change? If not, the material that Pizza Hut lost is just scrap for the converter. It may be easier for the converter to reuse that material, but its not totally eliminated from the system. - Also possible that this size reduction allowed the pizza box to go from a 4 out die-board to a 6 out die-board, thereby increasing their operational throughput by 50%! Either way, Corrugated suppliers are experts at maximizing their paper widths and machine widths and we do know that Pizza Hut would be running millions of these boxes, so I’m sure they were able to squeeze away some cost savings from this material reduction.